This depends partly on what shipping method you chose, partly on when you placed your order. The bookstore's online department is only open when the store is, so there is normally no staff working over the weekends. During our rush times, when financial aid is open, orders may take anywhere between 3 to 5 business days depending on the number of orders our online staff must fulfill. We make every effort to fulfill orders as promptly as we can. Dropships Any textbooks sent out through the drop-ship are picked up on scheduled dates which are posted to the bookstore's Facebook page and under the Textbooks menu. When drop-ship orders are picked up you will receive a call from that location to let you know. Drop Ship orders are not delivered directly to a home address. Our system will automatically send an email saying your order is ready to be picked up. Unfortunately, it is not something we can alter depending on the shipment method. The information for drop-ships is also in the order pickup confirmation email. Pick up at store: This means the order is to be picked up at the bookstore on LCCC's Main Campus in Elyria. College credit plus pick @ store: This is for CCP students so we can make sure they have the stickers they need on their books. CCP Students needing their books sent to a drop ship when the drop-ship window is open can put which campus in the order notes. UPS: CCP does not cover UPS shipping and UPS CANNOT deliver to PO Boxes. Other orders going out through UPS depend on their destination and times may vary. Q. Can I order my textbooks online and pick them up at the bookstore or another LCCC Campus? Yes, but please allow approximately 3-5 business days from the time you made your order for it to be processed. You will receive a secondary email when your order is ready for pick up. Please bring a copy of the ‘Order Pick-Up Confirmation’ email,it is the SECOND email you will receive and a picture ID to the customer service desk. If your last name has changed, or the order is other a different name or your order contains a laptop or tablet please let our staff know. The Commodore Books & More online order fulfillment department is not open on weekends. Orders placed between close on Friday and 8:30 am Monday morning will not be processed until Monday. Dropships Any textbooks sent out through the drop-ship are picked up on scheduled dates which are posted to the bookstore's Facebook page and under the Textbooks menu. When drop-ship orders are picked up you will receive a call from that location to let you know. Drop Ship orders are not delivered directly to a home address. Our system will automatically send an email saying your order is ready to be picked up. Unfortunately, it is not something we can alter depending on the shipment method. The information for drop-ships is also in the order pickup confirmation email. We appreciate your business! Q. I paid for my books with financial aid and my order was canceled, why? If there is an issue with your financial aid during the processing of your order, it will be canceled. If your order is canceled, please check your email for an explanation. If your order was canceled for any financial aid issues, please be aware that the bookstore's online department cannot disclose or adjust financial aid. Any questions regarding financial aid, amounts or any holds must go through the financial services department. If your order included items that are not covered by the SFA type in use the items not covered will be dropped. Orders are filled as they are marked when placed. . Ex. If a merchandise order is marked as College Credit Plus it will be dropped as CCP does not cover materials that are not required for class. Ex. An order that is not marked with the shipping option of a dropship or an order note will not be sent to a dropship location. Q. I paid for my books with my credit card and I received an email that there was a payment error, why? If there is an issue with your payment you will receive an email, if it is an issue not regarding fund availability we will attempt to recapture the payment as our system can time-out when we are processing large quantities of orders at one time. If you are paying with a credit card you have 24 hours to update your payment method before the order was canceled. Q. I am a financial aid student, and I am being asked for an account number. What number do I use? Anytime the system asks for your account number, enter your LCCC student number without the leading zeros. This is the number that we will use to process your order. When using Financial Aid for a web order you must include the term code on the checkout page immediately after your student number. If the wrong term code is included the payment will not process and your order may be canceled. CCP Students use the Financial Aid payment type for their textbooks so the charges can be given to their schools. Q. How do I cancel an order (or an item)? Q. I bought books online but I need to return them, how do I do this? If the order was newly placed you can make changes or cancel the order through your bookstore account. If the order is in picking status please use the email link on the bookstores home page to contact us to make changes to your order. You can bring the items into Commodore Books & More. Please bring your original packing slip and/or receipt. All shipping charges are non-refundable. All returns must be postmarked before or the day of the return policy window. (one week from the start of the class) and orders are not refunded until the items are in our possession. Items will not be credited to you until the bookstore receives the merchandise. If you have any questions, please call (440) 366-7515. Q. I would like my (brother, sister, spouse etc.) to pick up my books, what do I need to do? If you have any special instructions (“my child/friend/spouse is picking up my book,” or delivery instructions) please put into the order notes section of your order. Please note that any dropships listed in the order notes after the dropships have closed for the semester will need to be picked up from the store on the Main Campus in Elyria. Q. The website showed a used price for this book if I can’t order a used why is it there? Sometimes books will only be available in new conditions, this is most often when a book is bundled with an access code. We list used prices for most books for the rare occurrence that we may get a book back through a sellback or return and have to mark the book as a "used" because of some wear and tear to it . A book displaying a used price does not guarantee a used copy is available. Q. I was checking the status of my online order and it says 'Packed' What does that mean? New: The order was just placed and we have not printed it yet. Picking: We have printed your order and are working on putting it together. Packed: Your order has been processed, you will receive the second email letting you know it is complete and ready to be picked up. Dropped: Your order was dropped/canceled because of a condition substitution decline (if the entire cannot be filled), there was a payment error with Financial Aid, or it has been 24 past a credit card payment error. Please contact financial services with questions regarding your SFA funds or your bank regarding any declined payments with credit cards. I am a CCP student, how do I order my books? Any textbooks sent out through the drop-ship are picked up on scheduled dates which are posted to the bookstore's Facebook page and under the Textbooks menu. When drop-ship orders are picked up you will receive a call from that location to let you know. Drop Ship orders are not delivered directly to a home address. Our system will automatically send an email saying your order is ready to be picked up. Unfortunately, it is not something we can alter depending on the shipment method. The information for drop-ships is also in the order pickup confirmation email. If there is an issue with your financial aid during the processing of your order, it will be canceled. If your order is canceled, please check your email for an explanation. If your order was canceled for any financial aid issues please be aware that the bookstore's online department cannot disclose or adjust financial aid. Any questions regarding financial aid, amounts or any holds must go through the financial services department. Q. I'm a CCP Student (or, my child is a CCP student) and my credit card was charged, why? Our staff processes orders with the payment type listed on the order, as we cannot go through and individually check every order to see if the student/customer is in the CCP program. If you or your child is in the CCP program and the Financial Aid payment type is open or there are no notes on the cart pages about financial aid being closed then CCP uses the Financial aid payment option. You must change your payment type to the payment method you wish to use. 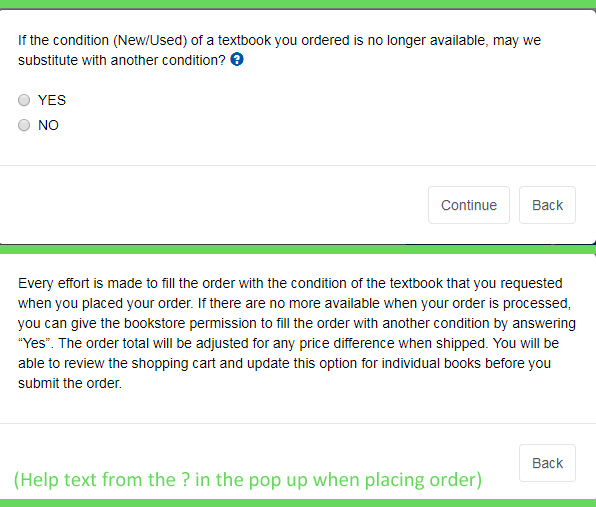 If you chose to not have your books substituted for the available condition in the "Book Condition Substitution" pop up(the first pop up) while placing your order and we did not have the condition selected then we cannot fulfill that item. Please keep and review your pack list when you receive or pick up your order. Textbooks are not charged if they are not fulfilled on an order. If you place another order we recommend selecting ‘yes’ to the condition substitution to ensure we can fulfill your order. Any questions regarding textbook backorders/ out of stock books should check the textbook menu for updates.